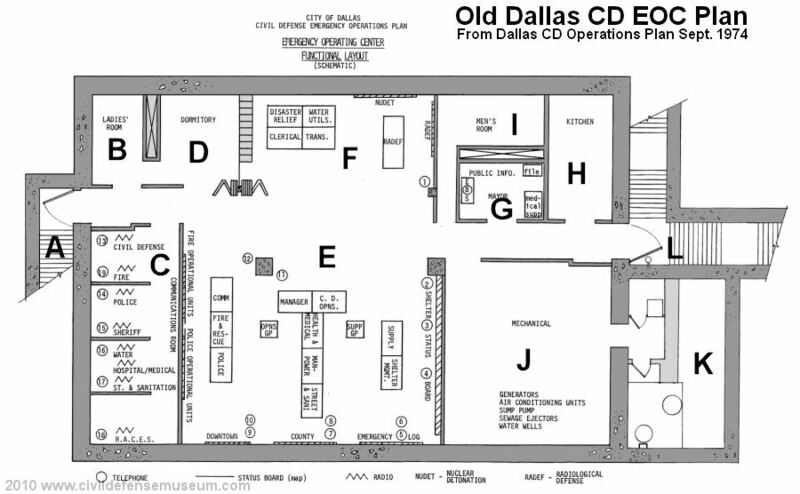 This virtual tour of the old Dallas Civil Defense Emergency Operations Center (EOC) was originally posted on this site in 2001. I originally tried to arrange this section as a walk-through virtual tour using the icons and links at the bottom of each page but the individual page links at the top of the page are probably easier to use. 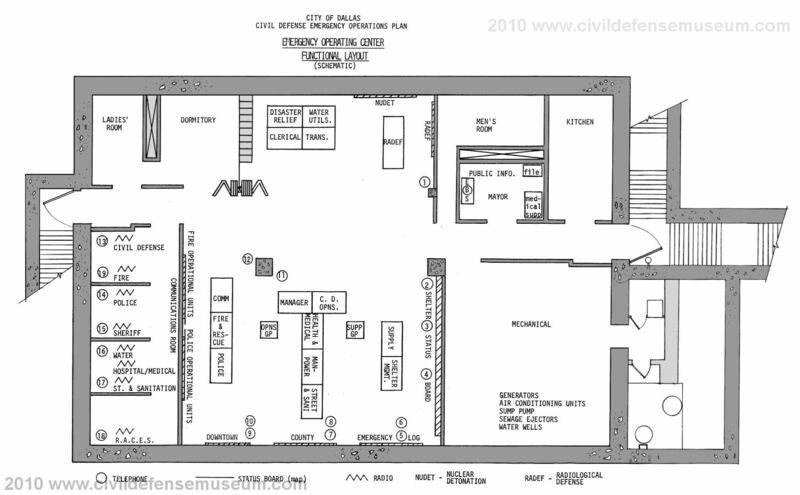 Each page covers a section of the shelter with a clickable master floorplan at the bottom of this page which also links to each area of the shelter. 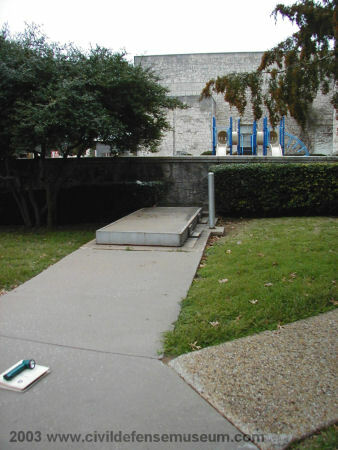 I was able to visit this shelter again in 2003 while accompanying a reporter with the Dallas Morning News who wrote a a story for the paper about the shelter. During the 2003 visit I was able to get more photos of things I missed in 2001. In early 2010 I completely rebuilt this section by reprocessing all the images and adding a number of documents. In July of 2013 I was able to go through the place once again and get more photos plus some video. 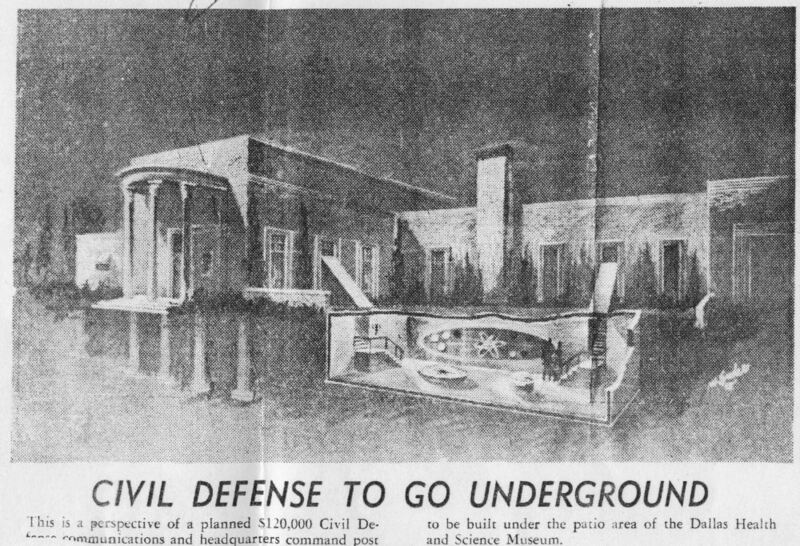 This headline and rendering of the Dallas Health and Science Museum with the proposed "Civil Defense Command Post" was featured on the front page of the May 22,1959 issue of The Dallas Times Herald. This artist's rendering is interesting, I can't figure out what is going on in the underground room. It looks like a giant atom is being displayed on a huge oval viewing screen of some sort. 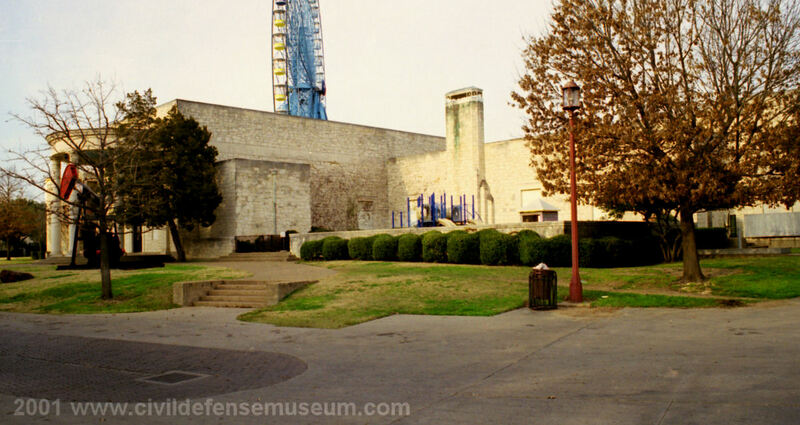 Here is the old museum building where the shelter is located as it was in 2001. Formerly known as the Health and Science Museum, this building is was the secondary building to the Science Place at Fair Park in Dallas Texas. Last time I was there in 2013 the building was not in use. As of September 2017, when I am redoing this page, I don't know the condition of the building or the old EOC. The old Dallas Civil Defense Emergency Operations Center (EOC) is located under the playground in front of the former Science Place Planetarium Building at Fair Park in Dallas Tx. 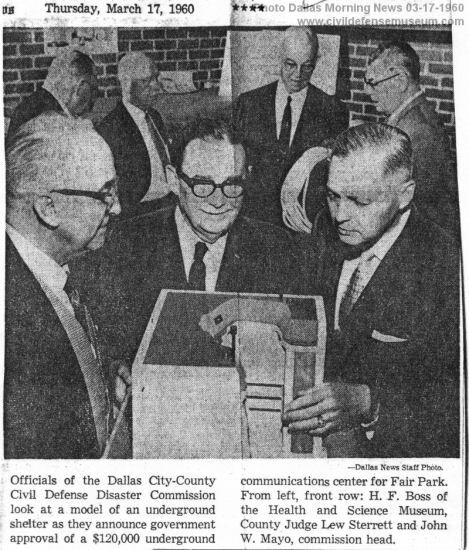 This EOC was to function as a relocation shelter for Dallas govt. officials in the event of a nuclear attack. It was from this shelter that officials would have tried to coordinate recovery efforts involving community shelters, radiological monitors, police, fire, sanitation and other services. Construction of the EOC lasted from 1960 to 1961 at a cost of $120,000. The City of Dallas paid $60,000 and the Federal govt. paid the additional $60,000. This shelter is a blast shelter in the true sense of the term. It is equipped with large concrete and steel blast doors which bolt shut when closed for sealing purposes. The exterior blast door is plainly visible next to the sidewalk on the southeast side of the building. The EOC also is equipped with air ventilators containing "anti-blast valves" which would close to prevent blast pressure from entering the shelter. The air circulation system was built with a separate air filtration room complete with a wall of air filters to remove fallout contaminants from the incoming air. According to a March 27, 1962 Dallas Times Herald article the shelter was officially opened on April 1st, 1962 at 3pm. The shelter is now closed to any public access and was only used for storage purposes by the Science Place in 2001. When I was there in 2013 the shelter had been cleaned out and the former museum building was not in use. As of September 2017, when I am redoing this page, I don't know the condition of the building or the old EOC. 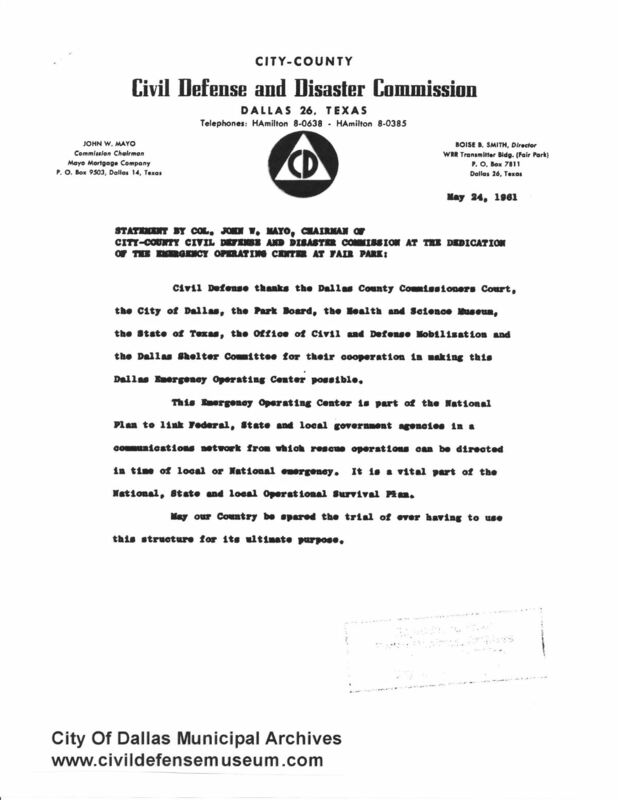 In March 2010 during a visit to the Dallas Municipal Archives I found this letter from the Dallas City-County Civil Defense and Disaster Commission thanking the various organizations involved in the construction of the Dallas Emergency Operations Center. The document is viewable in PDF or JPG image format. The copy is a little fuzzy but I think it's readable. July 18, 2013 Video Walk-Through. 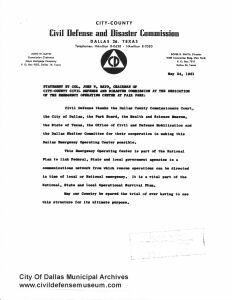 On July 18, 2013 The Friends of Fair Park group invited me to their annual meeting after which they were going to have their members walk through the old Dallas EOC. I was able to finally get a video walk-through of the shelter. I was a bit rushed because the camera only has 9.5 minutes of HD video capture available. The video is a bit shaky as well because I was holding the camera and a light to try to illuminate the darker areas. I hope the video shows the layout of the shelter well enough. Huge Thanks to the Friends of Fair Park for the invitation and giving me the opportunity to do go back through the old place once again. 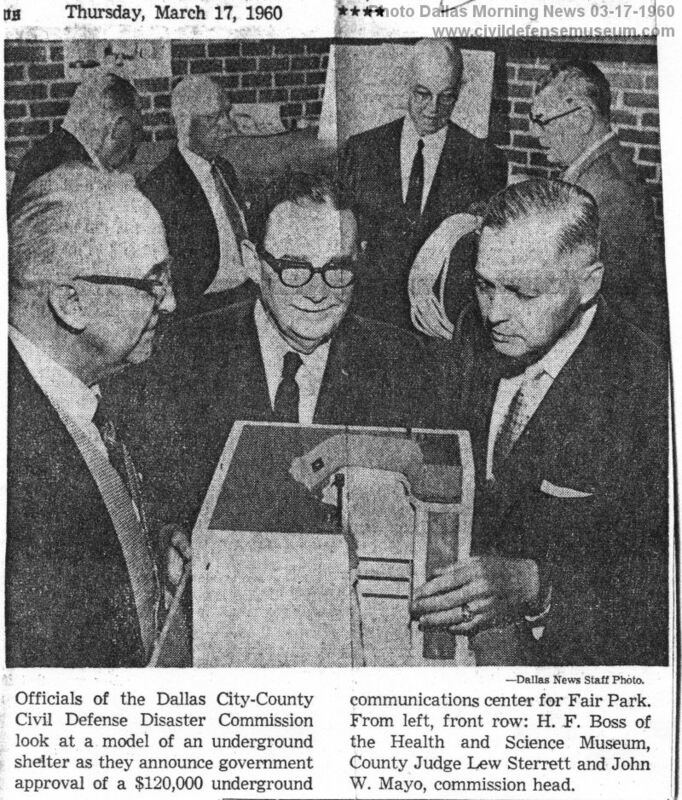 I would like to thank the people at the Science Place, (2001 and 2003) Perot Museum and The Friends of Fair Park (2013) for allowing us to take the photos of the shelter and The Dallas Public Library, Dallas history section for digging up the old newspaper articles. Newspaper articles and photos were reprinted with the permission of the Dallas Morning News. The above two photos show the outside entry blast door. This door is next to the sidewalk on the south side of the building near the parking lot. I believe the post next to the door was to secure the door in the fully open position so that large items could be moved in and out of the shelter. That's just a guess though. A playground is enclosed in the walled in area behind the door. The shelter is the full size of the walled in area. The rear inside building entry is just to the right, out of the picture, in the above left photo. Video of outside blast door closing. Spring/Summer 2009. Thanks to Matt Garrett of Richardson Emergency Management for this video of the outside blast door closing in 2009. Matt said that this is the last time the door was operated. The Perot Museum guide tried to open it in July of 2013 but the breaker tripped after the hydraulic pump ran for a few minutes. We couldn't get the breaker reset. I believe something failed inside the 50+ year old breaker because we couldn't even get it to reengage. The above left photo shows the intake air ventilator anti-blast valve. This view is looking toward the south corner of the playground area. 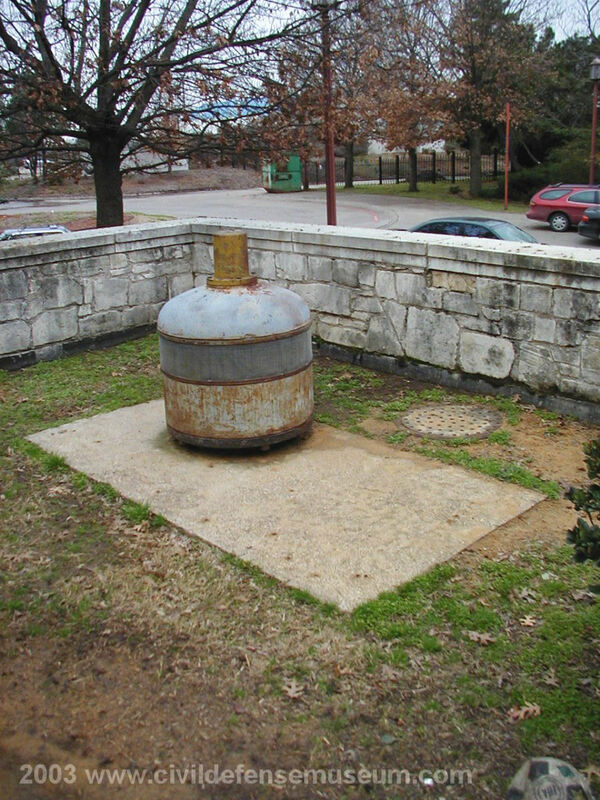 The air intake valve is sitting on a rectangular concrete pad. The manhole cover between the concrete pad and the wall is the Escape Hatch. 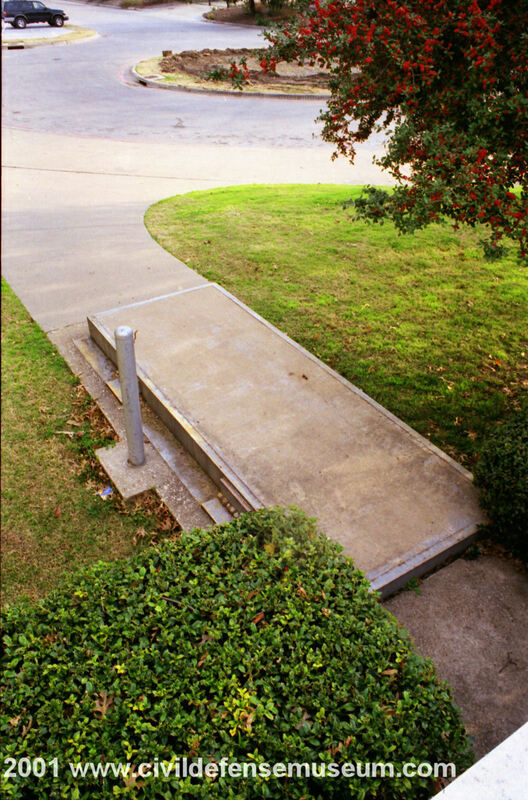 The ventilator concrete pad has the date "NOV 1961" written in one corner. The above right photo shows the exhaust air anti-blast valve. 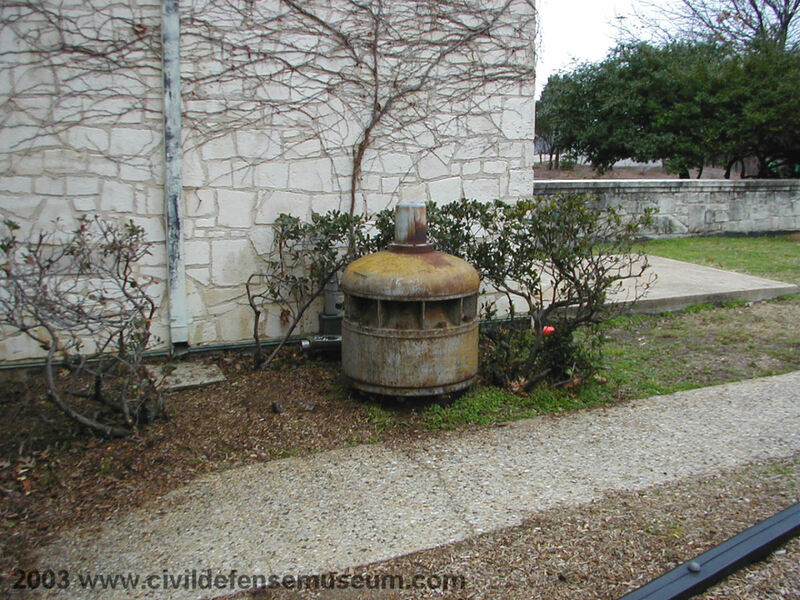 This valve is in the bushes along the side of the building at the adjacent corner of the playground. The exhaust air blower located in the Men's Restroom feeds into this valve to the outside. I'm not exactly sure how the ducting goes from the exhaust blower to this valve. If I have a chance to go back and walk through the shelter again I'll try to figure it out. This is the date plate for the air intake anti-blast valve. The manufacturer on the plate is Arthur D. Little Inc. Cambridge Mass. I wondered about the city going "all-out" to have such serious hardware installed on this shelter. It turns out that the anti-blast valves in this shelter have a very interesting history which I discovered during a visit to the City Of Dallas Municipal Archives in March of 2010. The anti-blast valves were supplied to the city as surplus property to the city from the Nevada Test Site. They were made available to the city for only the cost of shipping them to Dallas. 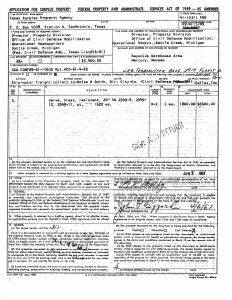 I located a letter in the construction records for this shelter which stated that the valves were available to the city as surplus because they had completed their testing at the Nevada proving area. 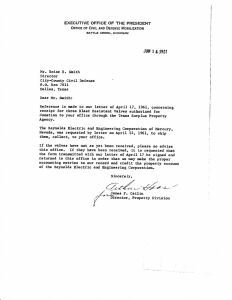 It says everything in the letter except that these valves underwent actual nuclear blast tests but they very well may have. I don't see why they would have been "tested" at the Nevada proving area unless that was the case. See documents below for info. 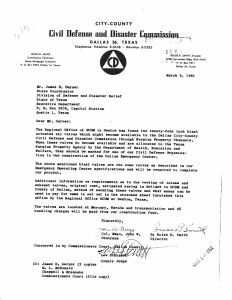 Here are several documents I found in the City Of Dallas Municipal Archives concerning the anti-blast valves in the old Dallas EOC. I was really surprised when I came across these. Click on each thumbnail to see the Adobe PDF file of each document. More intersting Anti-Blast Valve Info. While searching for info on the NEAR receiver I came across the following in the Research Projects section on page 24 of the 1957 Federal Civil Defense Administration Annual Report which was published in 1958. 7. Anti-Blast Valve Closures,A. D. Little, Inc.-The development, design, and fabrication of prototypes of anti-blast closures for ventilation openings in protective structures. The prototype devices were shipped to the Nevada Test Site for testing. 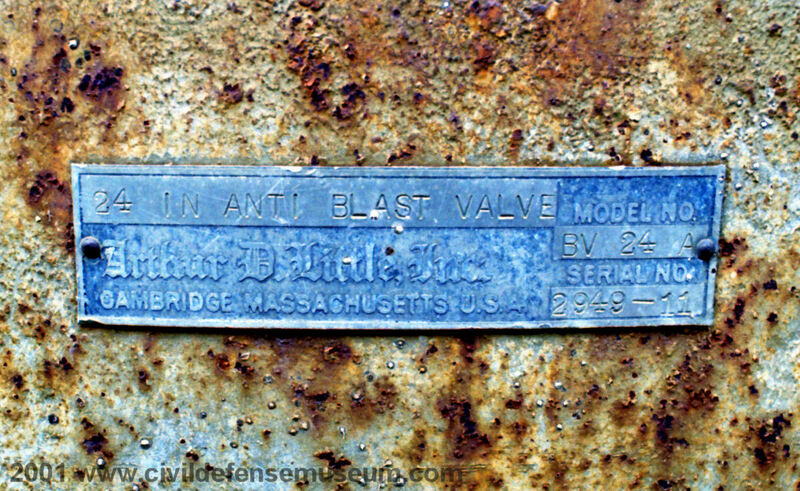 No mention here either if the Anti-Blast Valves were actually tested in nuclear blast tests. I might try contacting the Nevada Test Site Museum and see what they have to say.